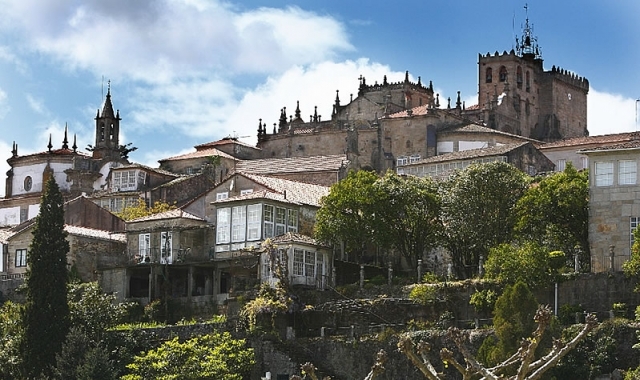 A view of Tui with the cathedral/photograph by Manuel Marras Tui is the gateway for entry in Galicia from Portugal and consequently has historically been an important passing town, even before the Jacobean pilgrimage itself. In any guide of the Camino de Santiago you will find the town of Tui mentioned as one of the most historically influx of pilgrims.Tui is the gateway for entry in Galicia from Portugal and consequently has historically been an important passing town, even before the Jacobean pilgrimage itself. Tui has an illustrious past within the history of Galicia and until 1833 it was one of the seven capitals in the kingdom of Galicia. Tui is an entrance town from Portugal to Galicia, and therefore one of the most important points of the Portuguese Way, the route that crosses the portuguese country from south to north, starting from Lisbon and ending in Santiago de Compostela. From Tui await us less than 120 kilometers route divided into five stages: Tui-Mos, Mos-Pontevedra, Pontevedra-Caldas, Caldas-Padron and finally Padrón-Santiago. Pilgrims with time to do so should visit Monte Aloia, a declared national park. If you are traveling on the Camino de Santiago or are planning to do so soon, you should know that the distance separating Tui from Santiago de Compostela is 115 kilometers.